What stories are you telling yourself today? What are you reading, hearing, thinking about, and passing on? If you started your day with newspapers – whether print or online, it’s likely you were bombarded with bad things that have happened. For me, wildfire, murder and political chaos dominate my headlines today and while it’s possible that my social media feed offers some light-hearted relief, I might need to scroll past the shouting in order to find it. In this kind of environment, it’s no wonder our mental health is suffering. Hope is an emotion that lifts heart and mind, but in a world smothering in greed, hatred and mounting CO2, hope is fast disappearing. So when I got a call to help edit a film for the Permaculture Association about a programme of theirs called Thriving Communities, I leapt at the chance to be part of a different story. The film brings together clips from projects around the UK using permaculture principles to address community needs. Though permaculture is often thought be only relevant for rural dwellers, many Thriving Community projects are urban- based, showing that the values of Earth Care, People Care and Fair Share are relevant, practical and can make a difference just about anywhere. Contrary to popular understanding, permaculture is much more than gardening, though growing food is a good place to start. Planting and nurturing seeds brings us into relationship with the earth and if we do it in a group, with other people as well. What’s more, it’s hard to miss the parallels between our own well-being and that of the plant, so growing food is educational as well as nutritional. Somehow, in addition to looking after soil and seedlings, we end up looking after ourselves, too. Living in the Future has always been about telling positive stories, but we need them more than ever now, as the clock counting down towards runaway climate change and species extinction ticks relentlessly towards ground zero. In the face of this, taking personal action can seem like an overwhelming task. Sorting the recycling, whilst important, seems too small a response. 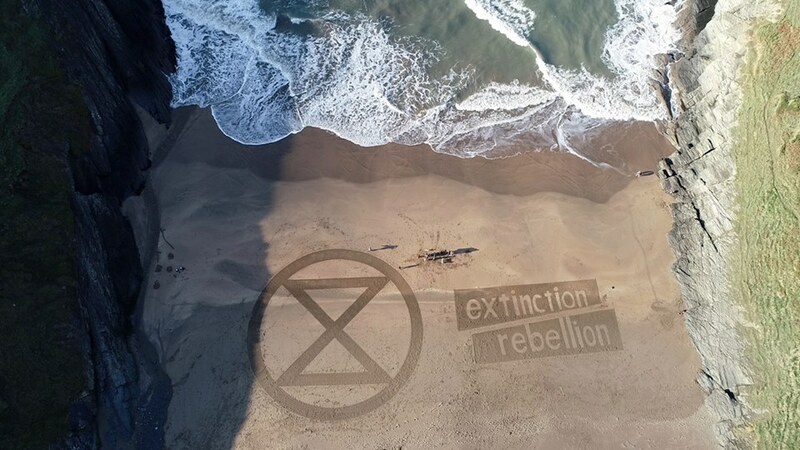 Given the enormity of the task we face, you may be drawn to take part in some way in the growing protest movement that is Extinction Rebellion. Organised on a grass roots level by activists calling time on government apathy and inaction, XR invites contributions in all sorts of ways, from engagement in non-violent direct action and associated support roles, to writing, artwork, and more contemplative practices. The question for us personally might be – how can I express my own response to this devastating global situation, in a way that feels both possible and sustainable? For instance, as I write this, my email is pinging notices from companies advertising Black Friday deals – is there a way we can make seasonal giving more earth and people-friendly? Can we show our love without buying more unwanted and unnecessary stuff? As our leaders charge headlong and blindfolded towards who knows what, my own experience of grief, anxiety and disempowerment has led me deeper into my own spiritual practice. Gardening is undoubtedly a part of this. Movements like the Permaculture Association and the Transition Network have long recognised that as well as positive actions, the alignment of our outer/inner worlds is an important and crucial part of the work and storytelling can really help with this. By bringing our expectations more in line with reality and suggesting new ways of dealing with challenges, stories help align our inner and outer worlds, helping us move more easefully through times of change. So let me ask again, what stories are you telling yourself today?